Vauxhall station (Zone1) on the Victoria Line. Exit station from Exit1 and turn right through the tunnel. 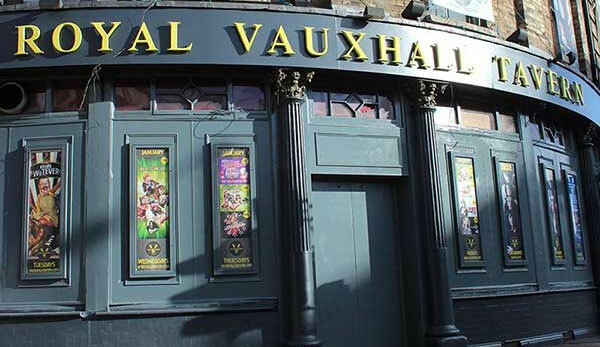 Vauxhall Tavern is the iconic victorian building as you exit the tunnel. The train station Zone 1 services central and south London exceptionally well. The train lines run from major stations Waterloo (2 minutes) and Clapham Junction (3 minutes). Vauxhall mainline station Vauxhall tube station and Vauxhall bus station sit together as a passenger transport destination as is less than a 2 minute walk to Vauxhall Tavern. The RVT has an accessible main door and is flat throughout the main space, accommodating wheelchairs. There are toilet cubicles that can be accessed without steps, but are not wheelchair accessible. The nearest accessible toilet is by Vauxhall Bus Station.